Battery-powered road and rail action are combined in one fun set. Thomas, Annie and Clarabel race around the rail track while Bulgy the double decker bus trundles along the road. 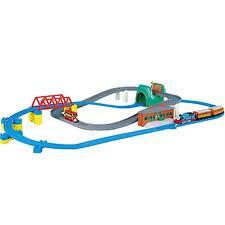 Features include sloping tracks, an impressive girder bridge, road and rail tunnel and Farquhar station. Combined track and road length: 5 metres. Set layout dimensions 1.4 metres x 0.7 metres approx.